The Wimmera River catchment is in the south-west corner of the Murray–Darling Basin. The main river is the Wimmera, which rises in the Pyrenees Ranges and flows across the northern foothills of the Grampians of western Victoria. The river ends at Lake Hindmarsh in the north of the catchment but in times of peak flow its waters will reach the Ramsar-listed Lake Albacutya. To the east of the Wimmera are 2 smaller, northward-flowing rivers, the Avon and the Richardson, which rise in the Pyrenees Ranges. Although in the Wimmera Basin, the Avon flows into the Richardson, which ends at Lake Buloke. Neither river connects to the Wimmera. Throughout the Wimmera catchment there are many lakes and wetlands that are of national significance, including Pink Lake, Natimuk Lake, Oliver's Lake and White Lake. The Wimmera catchment is 3% of the area of the Basin, and provides 1.7% of its inflow. The catchment uses only 1% of surface water diverted for irrigation and urban use in the Basin and less than 0.1% of the groundwater. The catchment is home to about 2% of the population of the Basin; and the income of the population is primarily derived from dryland agriculture and the supporting industries and services in the regional centres. Demand for water in the catchments exceeds supply and water is transferred from other regions for stock and domestic use, as well as some for urban supply. 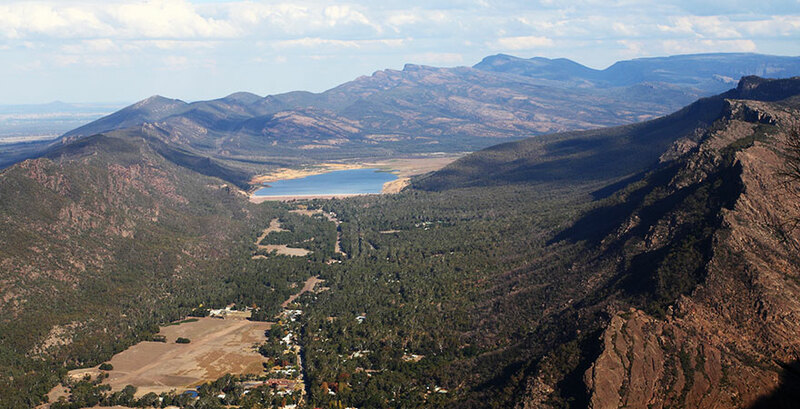 Lake Bellfield from Hall's Gap in the heart of the Grampians, Victoria. The Wimmera River is the largest land-locked river in Victoria. Its headwaters are near Mount Cole, south of the Pyrenees Ranges, in central Victoria. The Wimmera flows across the northern foothills of the Grampians, where many of its tributaries rise, and then turns north towards Horsham. After Horsham, the river flows for about 150 km, ending at Lake Hindmarsh — Victoria's largest freshwater lake. In times of peak flow, the lake will overflow and the Wimmera's waters will reach the Ramsar-listed Lake Albacutya and a series of smaller lakes in the Victorian Mallee. Yarriambiack Creek, east of Horsham, is a distributary stream of the Wimmera River and flows only when there is high flow. Yarriambiack Creek flows northwards past Warracknabeal and ends at Lake Coorong, near Hopetoun. Further east, Dunmunkle Creek is another significant distributary stream, which is highly-modified and carries water north from Glenorchy through Rupanyup, and dissipates in the southern Mallee. Within the Wimmera basin are 2 smaller land-locked rivers, the Avon and Richardson. Originating in the Pyrenees Ranges, the Avon flows northwards and joins the Richardson, which terminates in Lake Buloke. The Wimmera catchment supports a range of environmental features and significant wetland ecosystems. From ephemeral upland streams in the forested Pyrenees and Grampian ranges in the south (elevations up to 750 m), to large ephemeral lake systems in the lowlands in the north of the catchments (elevation of 100 m). Average annual rainfall varies across the catchment from 1,000 mm in the south to 300 mm in the north. While rainfall is variable, winter is typically the wettest season. Groundwater is found in both the highland and lowland areas of the region, and most aquifers are highly connected to surface water. In the lowlands fair to good quality water is contained in sedimentary aquifers, mostly in the south west of the catchment, which is underlain by marine deposited marl and limestone or marine sands. The Wimmera catchment is large and diverse, and covers the traditional country of several Aboriginal Nations, including the Dja Dja Wurrung, Wotjobaluk and Wergaia in the mid and lower catchment. The north of the catchment, towards the River Murray, is the traditional lands of the Latji Latji, Tatti Tatti and Wamba Wamba Nations. The Grampians mountain range, called Gariwerd by Aboriginal people, is a place of significance, because of its association with dreaming stories and the abundance of food, water and shelter it provides. English settlers arrived in the Wimmera region, with their cattle, following Major Thomas Mitchell's tracks after his expedition of the Wimmera region and naming of Mount Arapiles in 1836. The region is better known for its German settlers who arrived from South Australia in the 1870s and modified traditional European farming methods to build a successful grain growing industry across the region. The Wimmera region supports about 2% of the population of the Basin. Horsham is the major regional centre, with a population of about 19,000 within the city and in neighbouring rural localities (ABS 2011). Stawell, Warracknabeal, Dimboola and Nhill are also important centres in the region. The Avon–Richardson catchment has a small population, with the main towns being St Arnaud, Donald and Charlton. Dryland broadacre agriculture is the main industry of the region, with the production of cereal, oilseed and pulse grains. Dryland livestock production is also significant. A small amount of irrigation occurs for pasture production and there is some horticulture (particularly viticulture and olive production) in the catchment. Tourism is an important industry with the Grampians and Little Desert national parks and the Big Desert Wilderness Park drawing visitors to the region. The rivers and lakes attract nature-lovers, fishermen, hunters and water-sports enthusiasts to the central and northern parts of the catchments. Mount Arapiles in the catchment's west is an internationally acclaimed rock-climbing site. As of 2008, CSIRO reported 59% of available surface water was diverted but distribution losses were very high, with actual use only 20% of available water. The building of the Wimmera–Mallee Pipeline in 2010 was anticipated to reduce transmission losses by 80% or more. The catchment use 1% of surface water diverted in the Basin for irrigation and urban use. Groundwater extraction is low, less than 0.1%, relative to other catchments and does not affect water availability in the Wimmera River. The Wimmera River and its tributaries have been regulated since the 1840s. Storages were built on the tributaries of the Wimmera and weirs were constructed along its main channel to regulate supply of water to towns and for stock and domestic systems via channels. Water diverted for urban and rural use in the Wimmera catchment is captured and stored in a series of reservoirs and lakes on the tributaries of the Wimmera River. Water is managed through a system of 11 reservoirs and many diversion weirs along streams, channels and pipelines throughout the Wimmera Basin. In 2010, the channels were replaced by the Wimmera–Mallee Pipeline, which was anticipated to save 103,000 mL of water each year, by reducing transmission losses and evaporation. The water saved will enable increased flows in 4 river systems, however there have been negative environmental effects on lakes previously used as storages in the system. The pipeline replaced 18,000 km of earthen channel with 9,000 km of pressurised pipeline and associated structures. The regulated water system also provides water for towns outside the Wimmera River basin, such as Hamilton and Nhill. The Wimmera catchment supports a range of environmental features, significant ecosystems and a range of endangered flora and fauna. Environmental flows are used to improve the condition of the river channels as well as the lakes and wetlands where the rivers end. The Wimmera River ends at Lake Hindmarsh the largest inland freshwater lake in Victoria and nationally significant wetland. In wet years, water can overflow from the lake and fill Lake Albacutya an internationally important wetland listed under the Ramsar Convention. The lake only fills about 1 in 20 years, and it can take 3 to 4 years to dry again. Throughout the Wimmera catchment there are many lakes and wetlands of national significance, including Pink Lake, Natimuk Lake, Oliver's Lake and White Lake. The Sustainable Rivers Audit 2 (released in 2012) reported the overall ecosystem health of the Wimmera River to be poor. The numbers and diversity of native fish were rated poor, with alien species dominating fish biomass. The macroinvertebrate community was rated moderate condition, with the presence and occurrence of many expected families. Riverine vegetation was in poor condition on the lowland zone and very poor in the slopes zone. The physical form of the river was rated good condition, despite channel enlargement and simplification, and increased sedimentation. Flow seasonality and variability was rated in moderate condition. The Basin Plan specifies how much water is required to satisfactorily manage environmental sites and functions in the Murray–Darling Basin. A sustainable diversion limit (SDL) was established for each catchment (or group of catchments) and the reduction in diversions required to achieve the SDL was identified. The Basin Plan included the Avoca Valley and neighbouring Mallee region in its Wimmera–Mallee unit when determining SDLs for the region. The baseline diversion level of surface water is 129 GL per year. The required local reduction in take, to achieve an environmentally sustainable level of diversion is 23 GL per year. There was no additional contribution to a 'local reduction' amount to be recovered from the Wimmera–Mallee region, as required from other southern Basin catchments (the southern zone 'shared reduction') to meet the needs of the Murray system. Groundwater extractions and/or entitlements determined by the Basin Plan either matched or were considerably less than the SDL set for the groundwater units of the Wimmera–Mallee region. Therefore there were no required reductions in groundwater extraction. The Basin Plan allows for adjustments to SDLs if new works or changes in river operation and management rules increase the quantity of water available to be extracted; or efficiency measures through infrastructure works and upgrades reduce the quantity of water required in a delivery system. The use of environmental water in a specific catchment or region will vary from year-to-year. The MDBA has produced a Basin-wide environmental watering strategy to guide the use of environmental water across the Murray–Darling Basin to help achieve the best possible results over the long term. Environmental water managers make the day-to-day decisions on what to water and when, in line with the strategy and taking into account seasonal conditions, priorities and the availability of environmental water. Watering decisions are made in consultation with various waterway managers and local landholders. Catchment or regionally-specific details about environmental water use in the catchment including watering actions, portfolio details and planning, and monitoring of environmental watering, can be found through the Commonwealth Environmental Water Office or the state government environmental water manager (see table below). The management of the water resources is the responsibility of local, regional, state and Australian governments. Delivery to households, industry and farms is managed by local councils or regional water authorities. State government departments for water ensures the network of authorities manages water responsibly and fairly, that catchment and waterway health is maintained or improved through catchment management authorities, and that water saving, re-use and flood management projects are implemented. State governments must manage their state's water resources according to state and commonwealth water legislation.